In May and June 2018, Countrywise worked with CABI in Ghana to deliver 200 screenings of a series of five films on soybean agronomy. The films had produced the year before with technical support from ITTA and SARI. CABI had also commissioned music video featuring popular local musicians the Choggu Boys. The music videos explain all of the key stages in soybean agronomy in 3 minutes to a Hiplife beat, popular with the local community. CABI was delighted to give permission for the films to be used. 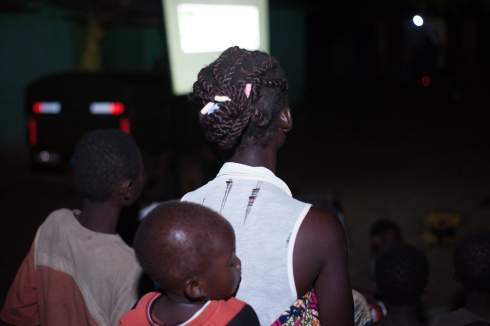 IFDC and Countrwise Communications organized a further 50 evening screening in villages in Yendi and Gushegu, in the Northern Region of Ghana. Another short film on harvesting soybean, made by the Feed the Future’s Agriculture Technology Transfer project, was also shown. Each evening finished with a question and answers sessions facilitated by the local government extension team. James Watiti explains: “We have been screening our films on soybean agronomy for the past two years. So far, we estimate that nearly 80,000 members of farming households have seen the films. We also estimate that something like 40,000 more farmers have seen the music videos that encourage soybean farming and explain the best soybean agronomy and post-harvest approaches. The IFDC screenings attracted audience totaling over 12,000 members of farming families. Overall, more women than men attended the screenings, in a pattern that has become common across the 350 screenings that have now taken place since May 2017. This win-win increased the reach of the CABI films at no additional cost to the organization and saved IFDC the expense of making their own films.